David Bowie is an English singer-songwriter, musician and actor. One of the most important figures in popular music for more than forty years, he is known for his distinctive baritone voice and the intellectual profundity of his work. He has sold more than 120 million records worldwide. Born “David Robert Jones” on 8 January 1947 in Brixton, London, his father was a promotions officer while his mother worked as a waitress. Bowie attended Burnt Ash Junior School where he was an active member of the school choir. As a youth, he started participating in skiffle sessions with friends, releasing his debut single “Liza Jane” in 1964. David Bowie started his musical career as a British folksinger. Inspired by such rock icons as Iggy Pop, Marc Bolan, and Lou Reed, he recreated his public persona. His single “Space Oddity” reached the top five of the UK Singles Chart in 1969. In 1972, he brought together a concept album and a stage show called “The Rise and Fall of Ziggy Stardust and the Spiders from Mars”. 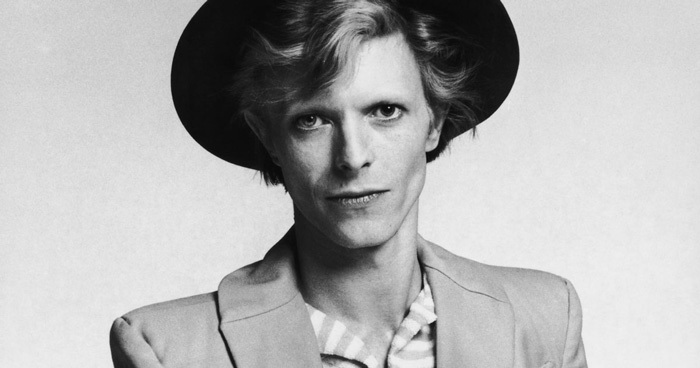 Bowie adopted a flamboyant character with orange hair, bizarre makeup, and futuristic costumes which he named “Ziggy”. Described by some rock historians as Bowie’s most outrageous persona, Ziggy was a messenger for extraterrestrial beings and a rock star who is trying to save the world. Bowie’s collaboration with ace composer and record producer Brian Eno produced three album; the minimalist album Low (1977), the krautrock “Heroes” (1977), and the more pop-oriented Lodger (1979). He achieved a new commercial height with the release of his 1983 album Let’s Dance, which comprised of several hit post-disco singles. Bowie continued to reinvent himself in a variety of personas, most notably “plastic soul” man and techno-pop avant-gardist. He has been one of the most successful movie actors among post-Elvis rock stars. David Bowie has won several awards and accolades. He won an Ivor Novello Special Award For Originality for his breakthrough single, “Space Oddity”. His performance in the 1976 sci-fi movie The Man Who Fell to Earth earned him a Saturn Award for Best Actor. Inducted into the Rock and Roll Hall of Fame in 1996, he has also won two Grammy Awards and three BRIT Awards. David Bowie has been married twice. He married American model and actress Mary Angela Barnett in 1970. They had a son together – Zowie Bowie – in 1971. The couple filed for divorce in 1980. Bowie married Somali-American model Iman in 1992. Bowie’s sexuality has been a subject of debate. He famously announced in 1972 that he was gay. However, in a later interview, he mentioned that while he has “fooled around” with guys, he “was always a closet heterosexual”.